On the Ghostbusters 2016 episode of Chatflix, host Echo spoke of the excitement of seeing a film about a bunch of brainy women talking about their areas of expertise, and just how rare an experience it was. Aside from that film and TV’s “The Bletchley Circle”, there really isn’t much similar on offer…until now. A fantastic period drama, Hidden Figures does everything you want such a film to do – it tells a story not widely known, educates its audience and encourages empathy. Taraji P. Henson, Octavia Spencer and Janelle Monáe play a trio of geniuses (genii?) who work at NASA during the height of the Space Race. So not only do our trio have to deal with being women in a male-dominated workplace, they also have to deal with being black in a country that still features racial segregation. Then add to this the fact that the nation has whipped itself into a frenzy regarding the Communist threat from USSR, what you’re left with is a film that skilfully deals with a variety of complex topics head-on. Henson and Spencer are excellent in their respective roles. I must admit, I was apprehensive with Monáe’s casting – she can sing and dance up a storm, but could she act? I’m happy to announce that she is indeed a triple threat. She has the most fun in her role, but also deftly handles the dramatic moments. The packaging may be rather generic – this is a period drama about social justice, with all the dramatic beats you’d expect – but the writing is wonderfully nuanced. 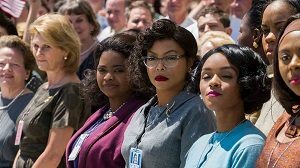 Like Zootopia before it, Hidden Figures looks at different kinds of prejudice. So whilst the film features outspoken racists, there are also subtler forms of discrimination on display, even by “well-meaning” characters. This kind of depth is exactly what a film like Hidden Figures needs. The film isn’t without a couple of flaws. The opening scene, featuring one of our characters as a child, seems redundant (and possibly tacked-on at the last minute), though this doesn’t take away from the rest of the film. Also, for some reason the version I saw in the cinema was shockingly low-res. I’m not sure if this was an anomaly, but the image was lacking definition (I even saw pixels around the letters in the opening titles), almost as if someone had projected a DVD onto the cinema screen. Hidden Figures is a solid outing to the cinema at 127 minutes, and I do wonder if it could have been streamlined further. No doubt the writers had already taken liberties with historical fact, but as mentioned earlier, the opening scene in particular is a waste of time, especially considering how perfect the second scene is. To say that the film is a blend of Apollo 13, Mona Lisa Smile and The Imitation Game wouldn’t be too far from the truth, but would also be unfairly reductive. Hidden Figures is an entertaining, effortlessly thought-provoking and powerful film.